Although the Raiders failed to lure ex-Packers executive Eliot Wolf to Oakland (Wolf ultimately accepted a new role with the Browns), they’re still aiming to hire a “young” assistant general manager and may also add an executive vice president of football operations, according to Jason La Canfora of CBSSports.com. Wolf would have seemingly been the ideal candidate for Oakland given his ties to general manager Reggie McKenzie, who is also a former Green Bay staffer. There’s no word as to whether the Raiders ever pursued yet another former Packers executive in Alonzo Highsmith, who — like Wolf — ultimately landed in Cleveland. No matter who Oakland hires, McKenzie is expected to share roster control with new head coach Jon Gruden. Prior to the Seahawks hiring Ken Norton Jr. as their new defensive coordinator, they also interviewed incumbent defensive line coach Clint Hurtt for the position, tweets Ian Rapoport of NFL.com. Although Hurtt was passed over for the job, he will stay on Seattle’s staff going forward, per Rapoport. Hurtt, who was the Bears’ outside linebackers coach from 2015-16, was hired by Seattle last January after an odd dance in which it seemed he’d land with the Jets. Hurtt’s decision to remain with the Seahawks shouldn’t obfuscate the fact that Seattle has revamped its defensive staff this month by firing both former DC Kris Richard and assistant head coach/linebackers Micahel Barrow. The concept of pending free agent Lions defensive end Ezekiel Ansah signing with the 49ers is being discussed in NFL circles, reports Matt Barrows of the Sacramento Bee. As Barrows notes, this is an “all smoke, no fire” situation, as there have been no reports officially linking Ansah to the Bay Area. However, Ansah — who rebounded with 12 sacks in 2017 after a two-sack 2016 — could theoretically thrive in San Francisco’s 4-3 scheme as opposed to what will be a Matt Patricia-led defense in Detroit, so this is something to file away for later. While Broncos quarterback Paxton Lynch certainly hasn’t been successful through two NFL seasons, he’s also had to deal with two head coaches, three offensive coordinators, and three different offensive schemes, as Nicki Jhabvala of the Denver Post opines. Lynch, the Broncos’ first-round pick in 2016, has only four games in two years with Denver, and lost the starting quarterback job to former seventh-rounder Trevor Siemian in both campaigns. The 49ers‘ summit with Josh McDaniels occurred today, but the team did not meet with Patriots director of player personnel Nick Caserio, whom it was curious about pairing with the 40-year-old coach. A Caserio/49ers summit — one the team requested — did not appear on the San Francisco brass’ docket, either because the Patriots denied an interview request or Caserio turned down the offer, Matt Barrows of the Sacramento Bee notes. A Patriots staffer since 2001, Caserio was a college teammate of McDaniels’ at John Carroll University. The longtime Patriots employee is signed through 2020 and interviewed for the Dolphins’ GM job in 2014. He makes approximately $2MM per year, Jeff Howe of the Boston Herald reports, adding that a 49ers job could interest the 41-year-old personnel man. Howe notes the 49ers are hoping to bring Caserio aboard as their GM, writing interview requests will continue to come his way due to the Patriots’ success and his current job title permitting those requests. ESPN analyst Louis Riddick, Colts VP of football operations Jimmy Raye III, Panthers assistant GM Brandon Beane, Packers director of football operations Elliot Wolf and Vikings assistant GM George Paton represent the other candiates for the 49ers’ GM position. Raye will interview with the team on Sunday. Here’s more from the NFL hiring period as the playoffs commence. Bears outside linebackers coach Clint Hurtt agreed to a two-year deal with the Jets to lead their outside ‘backers, Alex Marvez of Fox Sports reports (on Twitter). A Bears staffer for three seasons, Hurtt declined a contract extension in Chicago this week. The Bears denied Hurtt permission to interview with the Dolphins last season. The Panthers do not plan to make any coaching changes despite being the latest Super Bowl loser to miss the playoffs the following season. “This is a damn good coaching staff,” Dave Gettleman said, via David Newton of ESPN.com. “We went 17-2 last year. We didn’t get stupid overnight.” Carolina could have to deal with at least one change if DC Sean McDermott lands a head coaching job. He’s booked a second interview with the Chargers. 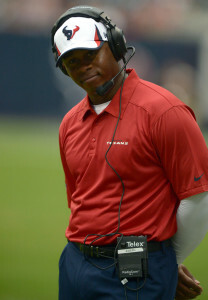 Secondary coach Steve Wilks also will interview with the Redskins for their DC job. A Kyle Shanahan defection to become a head coach would leave the Falcons with an OC vacancy, and Ian Rapoport of NFL.com notes (on Twitter) quarterbacks coach Matt LaFleur and offensive assistant Mike McDaniel are in-house candidates to ascend to that position. Of course, Shanahan could want to take a Falcons staffer with him, and Matt Miller of Bleacher Report tweets McDaniel would be a name to watch in that event. McDaniel has worked with Shanahan with three teams, joining him on the Redskins’ and Browns’ staffs before coming to Atlanta in 2015. Bears coach John Fox has another hole to fill on his coaching staff. Brad Biggs of the Chicago Tribune reports that outside linebackers coach Clint Hurtt recently declined a contract extension. The former Louisville coach is leaving the organization to pursue opportunities elsewhere. Hurtt previously coached the Bears’ defensive line during Marc Trestman‘s tenure in Chicago. 35-year-old Trent Cole recently indicated on Twitter that he wants to play in 2017. The veteran was solid in his seven games with the Colts this season, compiling 17 tackles and two sacks. The long-time Eagles standout is set to be a free agent this winter, and Kevin Bowen of Colts.com says the team’s desire to get younger may prevent Cole from returning to Indy. Ohio State LB Raekwon McMillan announced that he is declaring for the NFL Draft, reports ESPN’s Adam Schefter (via Twitter). The junior finished the 2016 campaign with 102 tackles, two sacks, and five passes defended. A recent mock draft by Yahoo’s Eric Edholm had McMillan going 56th overall to the Raiders. Players who are signed to reserve/future contracts rarely get any guaranteed money, but Deon Lacey is apparently an exception. ESPN’s Field Yates tweets that the Dolphins linebacker received a $200K signing bonus when inking his contract. With the Senior Bowl wrapped up and all four AFC East teams in offseason mode as Super Bowl 50 nears, let’s look at the latest news coming out of the division, starting with the Dolphins. Ryan Tannehill‘s inconsistency notwithstanding, Mike Tannenbaum‘s seen enough from the fifth-year quarterback to avoid spending a draft pick or signing a free agent for legitimate competition, Barry Jackson of the Miami Herald reports. This isn’t too surprising. Miami gave Tannehill $77MM in new money last May to be their franchise quarterback, and ending a year that began with playoff expectations at 6-10, the team has other pressing needs. The Dolphins have quite a few issues to sort out over the coming offseason, but chief among them will be overhauling their linebacking unit, according to Armando Salguero of the Miami Herald. Kelvin Sheppard proved enough at middle linebacker, but per Salguero, the club is aware that it needs an upgrade at that spot. Further, Miami is likely to replace one of its two outside linebackers, with Koa Misi being the most obvious candidate to be cut given his 2016 cap charge of roughly $4.88MM (the Dolphins could save $4.3MM by making him a post-June 1 release). For what it’s worth, Pro Football Focus graded Misi as the highest of Miami’s three ‘backers (No. 21), while Jelani Jenkins and Sheppard rated Nos. 38 and 84, respectively, among 97 qualifiers. Although interim coach Dan Campbell reportedly did not take losing out to Adam Gase with the Dolphins well, the team’s interim coach last season still could have joined Gase’s staff but instead chose to join the Saints’ staff as assistant head coach/tight ends coach, Jackson writes. The Dolphins, however, prevented multiple teams from hiring special teams coach Darren Rizzi. The Bears denied outside linebackers coach Clint Hurtt to speak with Gase about becoming the Dolphins’ defensive line coach, Jackson reports, but Hurtt coming to Miami once his contract expires after this season could still be on the table. A former Miami Hurricanes assistant, Hurtt would be an attractive option, per Jackson, if the Fins’ front falters under Terrell Williams, who got the job after Chicago chose to block Hurtt’s path. One GM told Lisa Wilson of the Buffalo News the Bills are trapped in “8-8 limbo” without certainty at quarterback and little money to spend this offseason. Another informed the reporter he applauded the team’s patience regarding Doug Whaley and resisting the urge to start over as many teams do in the Bills’ situation. Owners of the longest NFL playoff drought, the Bills are currently $3.4MM over the salary cap, per OverTheCap, but have strung together their most wins in a two-year span (17) since 1999-2000, the former season representing Buffalo’s last playoff advancement. Tyrod Taylor will also only count $3.13MM against the Bills’ cap next season. The Giants have hired Frank Cignetti as their quarterbacks coach, according to Newsday’s Tom Rock, and Dwayne Stukes as their assistant special teams coach (Twitter link via Alex Marvez of Fox Sports). Marvez reported Monday that Cignetti was a candidate to join Ben McAdoo‘s staff as the QBs coach, which has now come to fruition. Cignetti held the position in St. Louis from 2012-14 before a promotion to offensive coordinator last year. That didn’t work out, though, as the Rams fired him during the season. In other Giants news, their offensive line coach, Pat Flaherty, is interviewing for the same position with the 49ers, Marvez tweets. The Giants seem set to part ways with Flaherty, so it would obviously be in his best interest to land the 49ers job. The Bears have blocked outside linebackers coach Clint Hurtt from becoming the Dolphins’ defensive line coach, reports Thayer Evans of SI.com. Hurtt, who has one year left on his contract with Chicago, is rising up the assistant coaching ranks in the NFL and has drawn interest at both the pro and college levels, according to Thayer. Bills assistant head coach/running backs coach Anthony Lynn is a candidate to become the 49ers’ offensive coordinator. If he does, the Bills could replace him with Wilbert Montgomery, according to ESPN’s Mike Rodak (Twitter link). Montgomery – who has spent the past two seasons coaching Cleveland’s running backs – is familiar with Bills head coach Rex Ryan. Both were on the Ravens’ coaching staff in 2008. Adam Gase‘s new staff in Miami is already taking shape, with Bengals secondary coach Vance Joseph set to come aboard as the Dolphins’ defensive coordinator, Alex Marvez of FoxSports.com tweets. Marvez notes the second-year Bengals DBs coach will become the Dolphins’ new DC once the Bengals are eliminated from postseason play. Marvez’s report comes on the heels of NFL.com’s Ian Rapoport tweeting Joseph will have options after the Bengals’ season is over, but the Dolphins would definitely be targeting him. Joseph is in the final year of his contract, although other outlets say he’ll wait to see where Bengals OC Hue Jackson lands before deciding on his own future. Joseph has extensive seasoning as a secondary coach, presiding over the 49ers and Texans DBs from 2006-10 (in San Francisco) and 20 11-13 (in Houston). The Broncos attempted to interview the 43-year-old Joseph for their defensive coordinator position last season, but the Bengals didn’t permit the meeting, leading Denver to go with Wade Phillips. Marvez also reports (on Twitter) Joseph’s staff in Miami’s forming swiftly, with Bengals linebackers coach Matt Burke, Bears defensive line coach Clint Hurtt and Cowboys defensive backs coach Jerome Henderson set to come to Miami in those same positions under Gase and Joseph. Henderson already interviewed for the Browns’ head-coaching job, so a report linking him to another position coach job may be premature. He’s been the Cowboys’ secondary coach since 2012. Burke finished his seventh season as a linebackers coach. He taught the Lions’ backers for five seasons before coming to Cincinnati. Hurtt doesn’t have as much NFL experience, with 2015 representing his first season as a position coach. He was the Bears’ assistant defensive line coach in 2014. Although Reggie Nelson‘s eight interceptions finished the 2015 season tied for the league lead, the Bengals enter their wild-card game with the 20th-ranked pass defense. The Dolphins fired their defensive coordinator, Kevin Coyle, in October. When reports came out earlier today regarding Adam Gase being hired as the Dolphins head coach, NFL.com’s Ian Rapoport tweeted that Bengals defensive back’s coach Vance Joseph was expected to join the staff as Miami’s new defensive coordinator. However, Rapoport later clarified (via Twitter) that Joseph will be a target, but no deal has been finalized. Armando Salguero of the Miami Herald tweets that Joseph has had zero discussions with the Dolphins regarding the position. If Joseph does end up joining Gase’s staff, he’s expected to hire several notable names. Fox Sports’ Alex Marvez tweets that Bengals linebackers coach Matt Burke, Bears defensive line coach Clint Hurtt, and Cowboys defensive back’s coach Jerome Henderson would presumably join Joseph’s staff. Meanwhile, Albert Breer tweets that Hue Jackson is scheduled to have his interviews with the 49ers and Browns tomorrow. If he secures any of those head coaching jobs, Breer believes Joseph will be a target to become defensive coordinator (with Mike Solari an option at offensive coordinator). The Chargers request to interview Buccaneers defensive line coach Joe Cullen was denied, tweets Fox Sports’ Mike Garafalo. Bob Condotta of The Seattle Times gives a list of reasons why it’d be in the Seahawks best interest to move on from Marshawn Lynch (via Twitter): they’d save $6.5MM against the cap, he’s 30-years-old, and he only appeared in seven games this season. The Jets, Browns, Texans and Rams are among the teams scouting North Dakota State’s Carson Wentz at today’s FCS title game, according to Tony Pauline of DraftInsider.net (via Twitter).